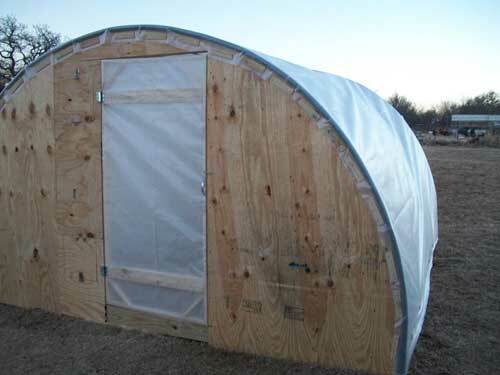 Just imagine if you had to know how to build a greenhouse in an emergency situation. In case of a natural disaster or just tough financial times, growing your own food is a necessary skill. In an emergency situation, there is no time to buy a kit or build an elaborate structure. A PVC pipe greenhouse is the perfect solution in times of need. Planning and Building a Greenhouse. This type of greenhouse will keep excess rain off the plants, block the wind and provide shade from the sun making it possible to grow a variety of plants all year long. They are inexpensive to build and can be put up in about a day using minimal tools and materials. Make sure you have the necessary tools and you can purchase and prepare the materials in advance so you are prepared for any situation. 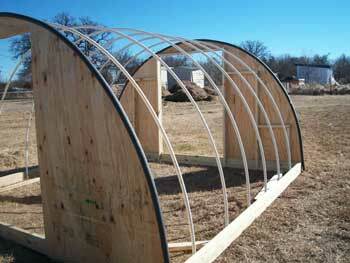 These instructions on building a greenhouse are for a 10’x21’ PVC pipe greenhouse that will stand about 7’ high. Here’s how to build your own greenhouse. Measure and mark out the perimeter of the greenhouse and drive a 30 inch stake into the ground every 36 inches along the 10’ sides. Use the ½ inch PVC for stakes. Fit the two end hoops together by using two 10’ lengths of 3/4” PVC joined with a PVC tee. Fit six more hoops together using the PVC crosses. The connections can be glued or dry-fit. You can reinforce the joints by inserting a 1’ length of 1/2" PVC through the joint. Slide the two ends of each hoop over the 1/2" PVC stakes. To finish the frame, start at one end and connect the hoops at the top using the 34 inch sections of 3/4" PVC. Secure the plastic to the frame with the 8 inch lengths of poly pipe. Make a slit lengthwise to fit over the PVC. You can also use large binder clips. Hold the sides of the plastic more secure by using lumber to add extra weight if needed. To add doors, cut the other piece of plastic in half to make two 10’x12.5’ pieces. Before you skin the greenhouse, lay one piece of the plastic over one end hoop. Allow at least one foot of plastic to lay on the ground. Use the poly pipe clips to secure the plastic to the end hoop. Cut a slit down the middle to make a door which can be tied open or help shut with something heavy like bricks. Repeat step 7 to make the other door. Now you know how to build a greenhouse. The design is easily modified to suit your needs. To extend the length, just add more ribs and a longer piece of plastic. To make it taller or wider, use more cross-bracing and more internal bracing to support the larger structure. Put your greenhouse where it gets a lot of sun to maximize plant growth. Learning how to build a greenhouse will prepare you for a situation where food or money may be scarce. With a little planning, few tools and materials and a couple hours, you can build a durable greenhouse that will accommodate your growing needs.